Never before have current trends been so influenced by ethnic vintage handcrafts as they are today. Often times what is considered stylistically relevant is mistakenly grouped with modern elements. However today we see more and more designers reaching backwards to search the depths of our own roots and the skills that lie therein. A treasured craft of our artisans is the “haath aari” stitch. The technique has been beautifully manipulated into the ” Tree of Life” motif by some of our most talented designers including Sania Maskatiya who was one of the first to pioneer the detailed pattern for Oscar winner Sharmeen Obaid Chinoy to wear to the 84th Academy Award Nominee Luncheon. The tree and all of nature’s components that go with it be it birds, butterflies, flowers, fruits, leaves etc are elemental symbols of life that have been artistically woven by some of Secret Closet’s other favourite designers as well including Rabia Wahab of Fiction Concepts whose signature work revolves around folk patterns, Madiha Zuberi’s open layout swirling garden patterns, and Ayesha Mustafa of Fashion ComPassion’s ethical and socially responsible label Nawa. Sania Maskatiya’s signature “tree of life” represents growth, prosperity and is an emblem of Mother Nature. The universal symbol dates back to the story of Adam and Eve and incorporates multiple local birds such as the cuckoo, sparrow, parrots, owl as well as other elements that include butterflies, creatures etc. The front is decorated with a peafowl, locally known as “Surkhab” a bird found in abundance in the province of Sindh. The extent of detailing in terms of the multiple colored threads for the feathers and petals on each figure is truly admirable and we can only imagine the painstaking hours of skilled labour required. The subtle trend to take away here is that your ensemble should convey a story or an essential thought. Bird motifs in the “tree of life” are a marked trend off late as reflected in the embroidered tapestries of Fiction Concepts by Rabia Wahab. The elaborate “chaddar” that forms a sky canvas for the motifs involves 30-40 days of intense manual handcraft employing the chain stitch. The result is a piece of art that you can treasure and pass on as an heirloom rather than discard and move on to the next trend! In this day and age of souring prices where the damage for a casual day wear cotton kurta is anywhere from 8-10k, invest intelligently in lasting articles that stay in style when the fashion brigade has passed! Although we adore everything vintage, the frame and silhouette affords a world of choice. 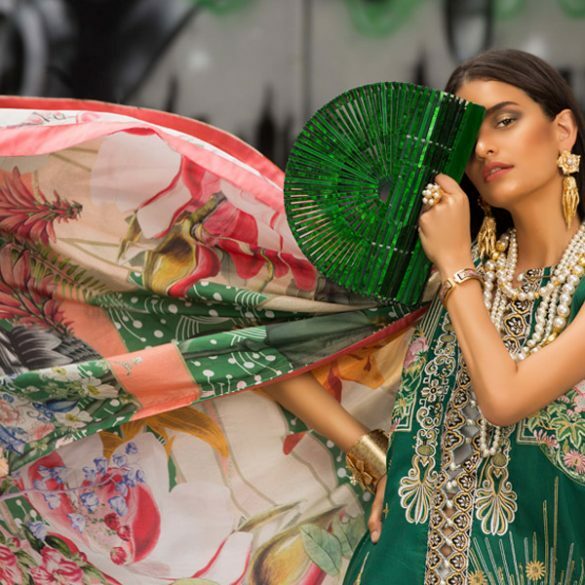 Madiha Zuberi shows us how to balance the traditional without the fuss. Her sleek black coat style ensemble carved with the “garden of life” stemming from the tree at the base and branching out to include blossoms and peacocks is beautifully executed. Using the haath aari stitch in resham and diamante she paints quite the picture. A worthy trend indeed! The “tree of life” has even been spotted on accessories! It just goes to show you how interconnected styles have become. Ayesha Mustafa’s Fashion Compassion is a UK based company retailing socially sustainable brands from various unstable parts of the world. One of the labels she supports is the high end luxury brand “Nawa” translating to “seed” in Arabic. Their signature over sized “tree of life” clutch represents creation and life and is handcrafted by women artisans in Lebanon. A truly individual piece that stands out and makes a great topic for conversation! Here’s a purchase that will actually leave you feeling warm and fuzzy unlike most of your other guilty ones! Tree of life embroidered leather and jute clutch by “Nawa”, retailed by Fashion Compassion by Ayesha Mustafa. Although we have covered some of our favourites there are many other talented designers working with theme motifs and patterns such as the “tree of life”. A timeless, happy and global trend that can be modeled at any age. An interesting common factor among three of the designers mentioned is their foundation and initial training ground. Sania Maskatiya, Rabia Wahab, and Madiha Zuberi all attended the proclaimed Indus Valley School of Architecture. We should take pride in the fact that this institute is responsibly churning out some of the best young talents in our industry and grounding them in our culture and traditions.